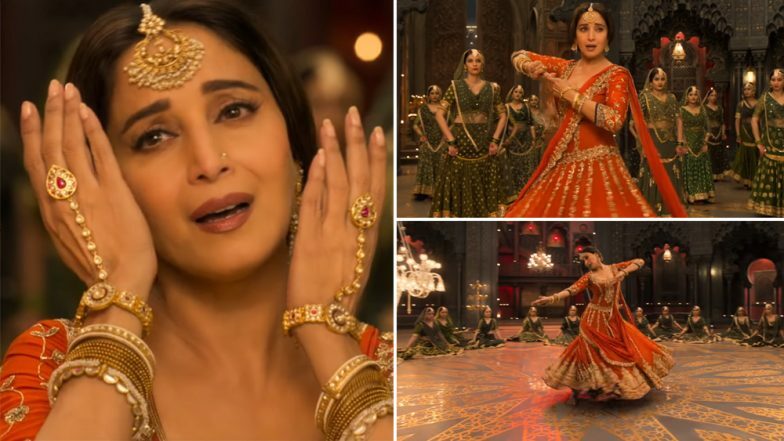 Kalank song "Tabah Ho Gaye" featuring Madhuri Dixit Nene is here! The much-awaited song from Kalank featuring Madhuri Dixit Nene is here. This is the fourth song from the film to be released after the much-talked about, "Ghar More Pardesiya", "First Class" and "Kalank" title track. The music of Kalank is so far receiving rave reviews from the audiences and the what's even better is that with each song, we are seeing a new level of grandeur in the production design of the film. "Tabaah Ho Gaye" featuring Madhuri Dixit Nene in an Orange traditional dress-up dancing to the lovely classical beats is a treat to the eyes. The actress is known for her flawless dancing skills and we have to say the level of grace she brings to the dance floor unmanageable for anyone else. The actress had rightly said the "Tabaah Ho Gaye" has nothing similar to her Devdas song "Maar Daala" and we completely agree. This song is on another level. Shreya Ghoshal's brilliant vocals compliment Madhuri's delicate moves and we are sure fans of the actress are going to fall in love with it. The song is receiving a lot of compliments from the fans and mainly because of the Shreya Ghoshal-Madhuri Dixit Nene combination. Both are highly skilled in their own talents and it is reflected in this masterpiece. The choreography of the song has been done by the veteran choreographer Saroj Khan who in the past too has worked with Madhuri Dixit Nene on some of the most iconic songs of her career. Kalank: Here's Why Varun Dhawan Thinks Making the Movie in Present was a Better Idea than the One with Shah Rukh Khan - Kajol. Kalank has been directed by Abhishek Varman and is set in 1945. The film also stars Alia Bhatt, Varun Dhawan, Aditya Roy Kapur, Sonakshi Sinha and Sanjay Dutt in key roles. The film is slated to hit the theatres on April 17.